en I was a new believer 33 years ago, I remember the excitement and enthusiasm I had to study the Bible and learn and grow. I joined a women’s Bible study in the book Hebreof ws. I could not get enough of it. I went through the study book in a few months when the class was working through it over eight months. The Bible study teacher mentioned to me that the other women were complaining it was too hard of a book to study. What did I know? I was new at this. We have all seen people long in the faith that appear to have shifted into neutral and seem to be coasting in their walk with Christ. And now I have been a Christian more than a few years. The easy thing to do is to coast along. 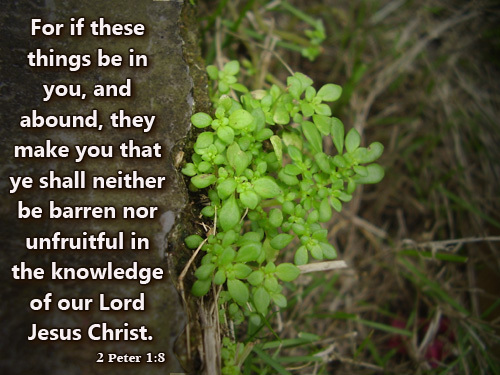 The very thing Peter warns us against. Am I growing in knowledge? Am I increasing in self-control? Am I’m growing in godliness? Is my brotherly kindness abounding? Are you feeling barren and unfruitful? Perhaps it’s time to ask yourself some hard questions. Are you bold enough to ask someone close to you if they see you abounding in these qualities? Let’s not limp across the finish line; let’s be so laden with fruit that we collapse fully spent, every last speck of energy used up to the glory of His name.